Do not eat roti canai or any oily food at least 4 hours before departure. Take anti-seasick pill if possible. Avoid being bringing too much accessories to make the trip as simple as possible. Expensive gadgets (video cams, camera, MP3) are not advisable to bring along. Please do not wear expensive clothing, squid might “shoot” you with black ink. “Candat” or squid jigging or fishing is becoming a very famous activity attraction in Terengganu. The sea of Terengganu is abundant with squid driving the months of March to August. The peak period of squid jigging is normally in May. The boat leaves port at 5pm and guest may opt for earlier return at 10pm or for the more “seasoned” anglers or “kaki laut” may stretch till the wee hours (6am). The “candat” equipment is provided on the boat and the fishing spot changes every night depending on where the squid “lobok” is. The greatest test of this jigging experience is not the catch actually, but of the guest endurance to seasickness……beware!!!! The whole idea sound so great, but falling in to seasickness will spoil the fun of the whole trip. 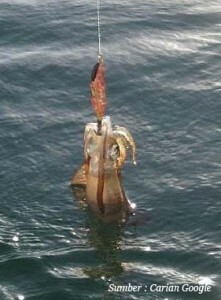 Nevertheless, if you can jig in time a few squid before getting seasick, it is already well worth the trip. That’s for sure! Personally, I think that the sea off Terengganu has more squid than fish. I reckon that is why it is becoming very popular.